The majority of bats eat night-flying insects, including many agricultural pests. As the primary predators of night-flying insects bats play a significant role in controlling insect populations. Estimates from studies show that some bats eat more than 70% of their weight in insects each night and some pregnant females at 100% of their body weight (that’s a lot of insects!). Another way of looking at it, taken from an example on the Bat Conservation International website, is that: “A single little brown bat can eat up to 1,000 mosquito-sized insects in a single hour.” Leading to speculation about their role in controlling mosquitoes – which may reduce the spread of malaria. De Hoop cave is the largest known roost in South Africa with an estimated 300,000 bats congregating there each year. Due to the large numbers of bats eating insects in the area (an estimated 100 tons every year) the farmers are believed to be saving thousands of rands on insecticides each year. New research, carried out by Professor Peter Taylor (University of Venda, SA) and colleagues, found that bats foraging around macadamia farms were eat stinkbugs - a major agricultural pest. The researchers collected bat droppings, from bats caught on farmland, that were then sent to the University of Copenhagen in Denmark for genetic analysis. The preliminary results show that stinkbugs remains were identified in the droppings of four of five species; namely the Egyptian slit-faced bat, mops free-tailed bat, little free-tailed bats, African pipistrelle bat and the yellow house bat. With ecosystem services receiving little attention until relatively recently we are just beginning to understand the impact of population declines and extinctions. 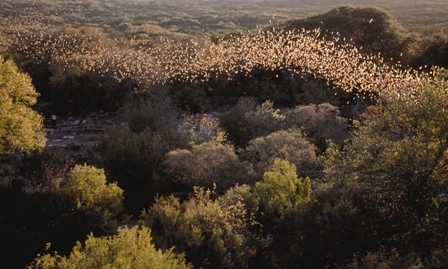 Bracken Cave, in Texas, has the largest known (insectivorous) bat roost in the world. In fact it is the largest congregation of mammals anywhere in the world! Mexican free-tailed bats congregate here in numbers estimated to be over 20 million to have their young. These bats primarily eat corn ear worm and cotton bollworm moths, which are agricultural pest species that cause millions of dollars in damage to crops each year (as reported by Bat Conservation International). "Production of at least one third of the world’s food, including 87 of the 113 leading food crops, depends on pollination carried out by insects, bats and birds. This ecosystem service is worth over USD200 billion per year." (source: IUCN - Securing the web of life, June 2012). About a third of bats are fruit or nectar feeding, and in the process they pollinate numerous plants and disperse seeds. Kasanka National Park in Zambia has the largest known fruit bat roost on earth! Impressively, an estimated five to eight million straw-coloured fruit bats migrate to Kasanka National Park between October and the end of December each year for what is now considered to be the biggest migration in Africa! Yes, our furry alies even beat the magnificent Great Serengeti migration. Fruit and nectar feeding bats pollinate many plants, including an estimated 450 commercial plants used by us. Foods such as bananas, peaches, guavas, mangoes, avocado, figs, dates, papaya, almonds, cashew nuts, vanilla and other products such as tequila (from the agave plant), carob and many more. In the tropics many plants are pollinated by bats, attracted to their strong scent at night and bats are important seed dispersers for many tree species. Fruit bats pollinate the legendary baobab tree – these iconic trees have cultural and aesthetic value. Baobabs are affectionately known as the 'upside down tree' or the 'tree of life' - for good reason, these trees provide shelter, water and food people as well as other animals.